Of all the many pathogens that cause hospital-acquired infections, roughly 90% are bacteria and 10% are fungi. Approximately 82% of all hospital-acquired infections are caused by only 8 main pathogen groups. We know this thanks to the regular reporting by thousands of hospitals each year to the National Healthcare Safety Network at the Centers of Disease Control and Prevention. These hospitals provide not only the number of HAIs, but also where those infections took place, which organism caused the infection, and whether the organism was antibiotic-resistant. Studies have demonstrated how long each of these pathogens can survive on surfaces, helping hospital infection control specialists to determine cleaning protocols and where technology can help fill the gap left by human error. In order to test persistence, researchers first acquire a sample of the organism from a biological resource center (such as ATCC), and create a culture of that organism in the lab. Then they artificially contaminate many small coupons, standardized sections of the same material. These surfaces are then periodically checked for living organisms. 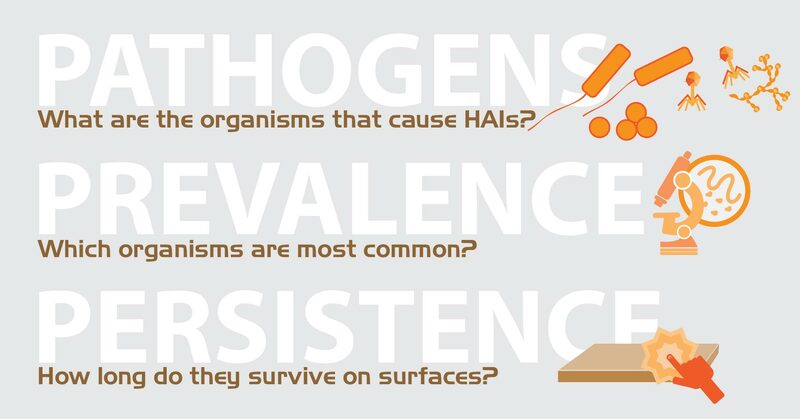 Here are the 7 main pathogen groups, their persistence on surfaces, and their prevalence in hospital-acquired infections. How long it can survive, depending on environment? Why do some organisms survive longer than others? It depends on three main things: the relative humidity, the temperature, and the ability of the organism to create a biofilm. Some organisms survive very well in dry conditions due to their cell wall structure (namely, Gram positive bacteria), while others do not. While it is shocking to see just how long some organisms can survive on surfaces (over 2.5 years! ), let's not overlook the bottom range for the top two pathogens. The bacteria that cause the most HAIs can survive at least 5-7 days on a surface. Add to this group coagulase-negative staphylococci and you see that 40% of the HAI-causing bacteria can survive on surfaces at least 5 days. With studies showing that hands contaminated with pathogens can transfer the infectious agent to 5 more surfaces or 14 other subjects, the importance of making sure that surfaces are free from contamination becomes clear. The numbers show us that human processes are just not enough.